On any given night, there are up to half a million people in the U.S. sleeping on the streets. Homelessness has been a recognized problem in the U.S. since the late 1800s, but the numbers of homeless in the U.S. has risen dramatically since the housing crisis in 2008. The majority of today’s homeless population is in California, Oregon, and New York. With about 75% of U.S. households living paycheck-to-paycheck, millions of Americans are one crisis away from ending up on the street. However, mental health issues and addiction often precipitate an individual’s slide into homelessness. So, what’s the connection between addiction and homelessness in the U.S.? 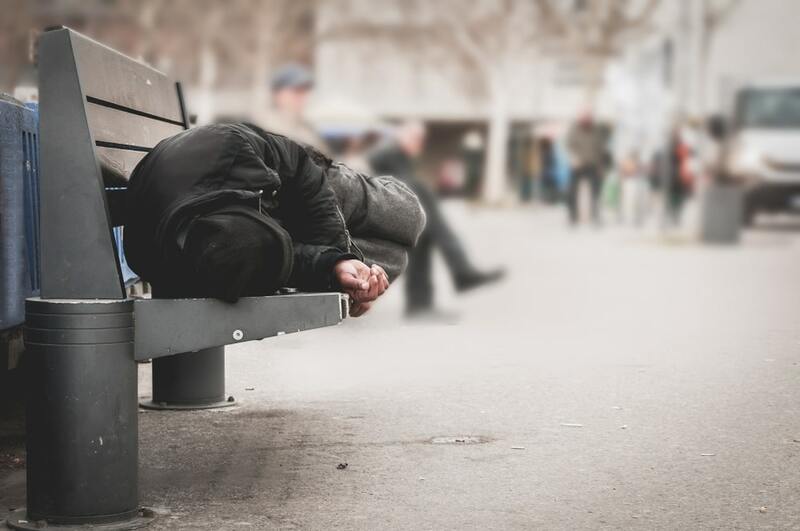 The following article will explore how substance abuse plays a role in understanding the links between homelessness and addiction. What are the different subtypes of homelessness? Homelessness is often a temporary situation and not a permanent issue someone faces, although there are several thousand chronically homeless people in the U.S. When homeless rates are calculated, they are often calculated based on how many people in a given night are sleeping either on the street, in shelters, or transitional housing. Homelessness is usually defined as a person who lacks a fixed, regular, or adequate nighttime residence. Unsheltered homelessness is where someone is living on the street, in their car, camping outside, or in an abandoned building. Sheltered homeless are those who stay in a shelter or transitional housing. Doubled up homeless are those who stay with friends or family temporarily. For people who suffer from homelessness, they often lack the resources necessary to seek treatment for mental or physical health problems or substance abuse. Living on the street or in precarious housing situations can also make someone susceptible to turning to drugs or alcohol to cope with the stress, or to self-medicate a health problem. But in many cases, drug abuse or addiction happen before a person becomes homeless. The financial, legal, and behavioral difficulties addicts face can make them incredibly vulnerable to losing their homes. What role do substance abuse and addiction play in rates of homelessness? Surveys conducted on homeless populations and those in transitional housing have found a link between addiction and homelessness. Alcohol abuse and addiction are common among older people who suffer from homelessness. Around 38% of the homeless are addicted to alcohol. About 26% of homeless abuse drugs. Younger homeless individuals are more likely to abuse drugs than alcohol. Two-thirds of surveyed homeless adults reported that drugs or alcohol abuse played a significant role in their slide into homelessness. 68% of surveyed cities said that drug and alcohol addiction was increasing their rates of homelessness. Cross-cultural surveys on the homeless and the precariously housed have found similar rates in the U.S. and UK, followed by Belgium, Italy, and finally, Germany. Because of the transient nature of homeless, there are few other cross-cultural studies on homelessness and studies which do exist but are not complete. However, homelessness rates in these countries are attributed to similar issues – addiction, mental health issues, domestic violence, and economic uncertainty. How do mental health issues play a role in homelessness rates? Around two-thirds of the homeless struggle with substance abuse disorder and a comorbid health condition. Of those who struggle with chronic homelessness, around 30% of them suffer from a severe mental health condition. Physical and mental health issues make it incredibly difficult for people to obtain and maintain an adequate, fixed shelter. Rates of the mentally ill homeless soared in the late 1970s when many state mental health hospitals were closed. Unfortunately, public policy did not replace these closed hospitals with any viable alternatives, leaving some of the most vulnerable members of society at-risk for homelessness stemming from untreated mental health conditions. People with mental health issues are also at risk of turning to drugs or alcohol to alleviate their symptoms. When drugs are much easier to obtain on the street than mental health services, the result is a population of chronically homeless with addiction and mental health issues. How does alcohol play a role in homelessness rates? Survey findings indicate that alcohol dependence in childhood was a significant factor in chronic homelessness as an adult. Because the homeless are not included in census data, more detailed reports on homelessness and addiction are difficult to obtain. But in reports and findings that have been conducted, the link between substance abuse, mental health disorders, and domestic violence is apparent. What can be done to help the homeless who suffer from addiction? Treating addiction when a person has access to stable housing is challenging, and when the patient faces homelessness, the struggle can be even more intense. For the homeless, it’s crucial that the limiting factors involved in homelessness are addressed. In order for treatment to be successful, homeless addicts need access to stable, safe housing while in recovery. It’s also important that staff at a treatment center are flexible and experienced with caring for this part of the community. Rehabilitation services that offer customized treatment plans that also use integrated models of care are crucial to achieving positive outcomes. Because the homeless often suffer from comorbid conditions, they need access to an experienced, multidisciplinary team of healthcare professionals on-site that can coordinate customized treatment plans for these patients. Homeless patients, in particular, need care plans that treat their condition holistically, instead of only treating specific symptoms of addiction and mental health in isolation. Outpatient programs and also non-residential treatment centers can provide a broad range of services in addiction treatment that the homeless need. Detox, along with individual counseling and twelve-step programs that address the patient’s living situation are incredibly useful for alleviating addiction and homelessness. If you or someone you care about is struggling with the threat of homelessness brought on by addiction, the drug abuse counselors at Windward Way rehabilitation center can help. Please contact them today to overcome drug abuse and addiction.